The information on this page has developed for you from the expert work of Roelie Wolting alongside the Enablement Cerebral Palsy Project and Handicap International Group. The International Classification of Functioning, Disability, and Health, known more commonly as the ICF, is a classification of health and health-related domains. 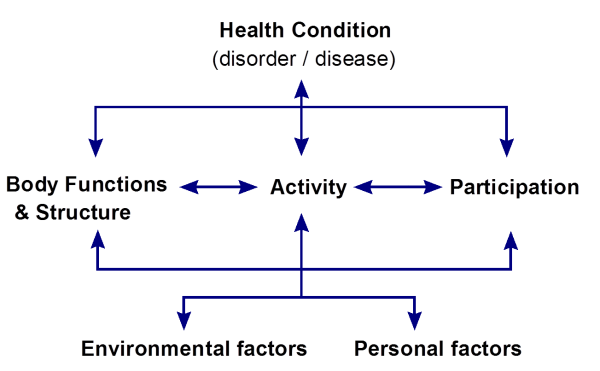 These domains are classified from body, individual and societal perspectives by means of two lists: a list of body functions and structure, and a list of domains of activity and participation. Since an individual’s functioning and disability occurs in a context, the ICF also includes a list of personal and environmental factors. All these factors are related and influence each other. The ICF is WHO's framework for measuring health and disability at both individual and population levels. Using ICF provides a (scientific) basis for understanding health and health-related states. It supports looking at and analyzing other factors which influence how people with a disability function and participate in their society/community. The ICF establishes a common language around the world and within the Community Based Rehabilitation (CBR) context. The ICF also enables people to look beyond impairments and activity limitations such as; social, environmental, personal and cultural issues. Internationally the use of the ICF in rehabilitation services is becoming increasingly popular. When working with children with CP and their families, one task is to relate how the therapeutic activities are connected to the desired outcomes. Traditionally, therapy was impairment-based, focusing on addressing the problems of body function and structure which were thought to underlie the functional limitations of the 'disability.' Leading to an assumption that 'treatment' will produce functional results and also perhaps an unspoken belief that more therapy will produce better results. The ICF model provides an opportunity from the outset to talk with parents (and older children) about a different set of primary goals that address function (activity) and social engagement (participation). Using this model will improve results of interventions. A child with CP who has problems with eating and speaking because of motor control within the face and mouth area may benefit from assessment and intervention focused on motor impairments that make feeding or speech challenging. At the same time, addressing the activity of eating and the child’s participation in family mealtimes, as well as alternative communication strategies, if necessary, ensures that all components of the child’s functioning and health are addressed at the levels of body structure and function, activity and participation. People / parents are much more likely to work on things that are important to them than to work on exercises others think are important. How to make eating easier in practice and how to communicate is more important than doing exercises to (hopefully) improve mouth muscle control. Advice on how to use eating time and how to communicate and stimulate the child to communicate during activities of daily living will give much more practice in using the muscles in the mouth area compared with doing exercises everyday for 20 minutes(which might only be done once a week). A child with CP may be able to walk when there are no physical barriers on a smooth terrain. When recognizing the importance of the role of the family, supporting the family is essential. The family has to be involved in setting functional goals in what to achieve. In doing so the family can help to achieve greater functional achievements with less effort compared to traditional impairment-based therapy. 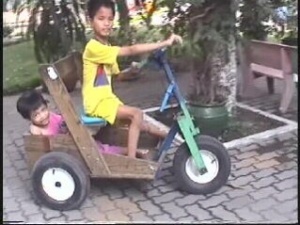 This child is mobile with this tricycle but not when walking. 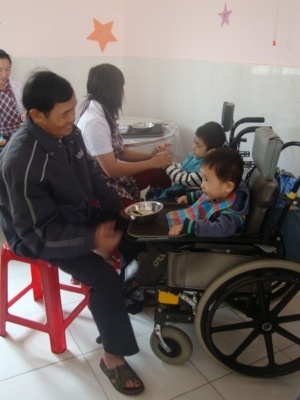 The house, community, and school environment may not be barrier-free and assistive devices can be necessary for this child to participate in school and community activities. The impairment (balance, muscle control and strength) may not be addressed directly but the net functional benefit for the child may be considerably improved because of active participation and it is likely this will lead to improvements in the underlying impairments as well. 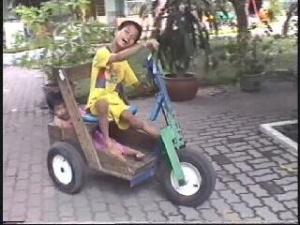 Try to analyze yourself: what impairments are improving if this child is biking around? The Rehabilitation Problem Solving (RPS) format is based on the concept of the ICF and is being used increasingly in the international field of rehabilitation. This RPS form also provides room to write down the opinion of the parent and/or the child about the abilities and disabilities. The space for input by the client is based on the understanding that involvement in the whole assessment and planning is important in order to be able to make interventions meaningful and successful. This girl lives with her parents and grandparents. All love her and are taking good care of her. She is dependent in all activities of daily living (ADL). She can sit for a few moments without support but not stand or walk. She cannot eat, bathe or dress by herself. She stays at home, does not go to school/kindergarten/nursery. She understands everything, speaks some words but not clearly. She points to make it clear what she wants. Focus is on physical rehabilitation because the parents think she needs to be able to walk before going to school. Here is an example of a RPS form for this young girl. It is important to not only look only at what the limitations and restrictions are but also to look at what the child can do: what are the abilities and how to improve those abilities. Look at what the child participates in: what are they already doing? How can this be built on? The ICF / RPS does not only look at impairment, activities, and participation but also at the relationship with and influence of environmental and personal factors. Ethnic background: discrimination of ethnic minorities takes place in many countries; adding disability to this can increase the risk of discrimination. Roads, transportation system, and traffic: all can cause big barriers or opportunities. Values and beliefs: what people believe is the cause of disability, and how are people with a disability treated by society. Services, systems, and policies: did the country ratify the UNCRPD? What policies are there on education, and more importantly: if the policies are implemented. Are there accessible health / rehabilitation services? Some professionals in the rehabilitation sector like to work in a clinical setting. Often the clinical setting is perceived as giving higher status because of the 'white coat' and for physiotherapists the use of machines such as ultrasound and other electrotherapeutic modalities. Many professionals think this is the setting which gives the best opportunities to apply their knowledge and skills. Some therapists think they know what is best for the client/child and they do believe that parents should follow their instructions. Parents and children have to comply and are only active implementers of instructions. If the progress is not as expected the parents are blamed for not doing enough exercises with their child. Many goals are impairment oriented or too broad. Usually the child does not have any influence at all. Working with children is best done in the home setting and not in a clinical setting. A white coat may even scare children. With children you do not need (and should never use) machines. Working with children always includes working with the family and sometimes/often teachers in schools. Only working in a ‘team’ with parents and child on an equal basis will give the most rewarding results. When results are not as expected the therapist has to change and adapt; probably explanations were not clear; the interventions did not fit in the daily routine of the parents/child. The child will be much more motivated if s/he is involved in decisions regarding what to do and what to learn.